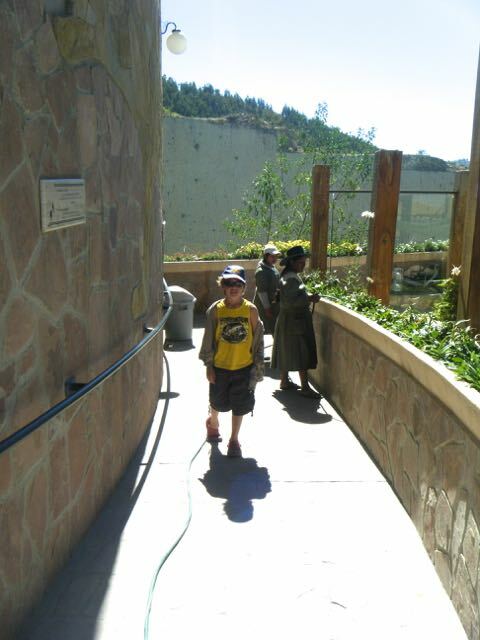 It is Monday, and time to go exploring for dinosaur footprints which we are pretty excited about. Today’s exploring in Sucre, Bolivia is on an educational level. 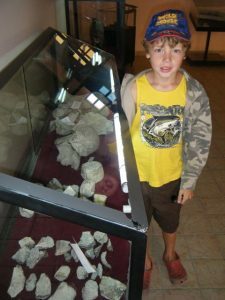 One thing, as a single traveling parent that I try to keep a balance with, is education and exploring. This needs to be balanced with rest and fun time. A child gets just as worn out both physically and mentally if not more so than an adult. So to expect an eight-year-old to study on the move is often tricky. I try to let the world we are in teach him and this is called world schooling. 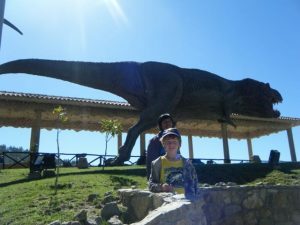 Therefore, today we are off to learn at Parque Cretacico in Cal Orck’o cliff and is the place to see dinosaur footprints and tracks. In fact, we find out there are over 5000 footprints that have been found so far. 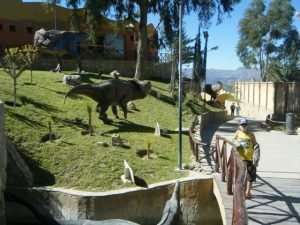 So we find out how to get a local bus to this park and the easy part is that we are told to catch the bus at the end of our street in front of the Sucre Bus Station. But on arriving we sadly choose the wrong side of the road, and as the numbers on the buses go both ways, we head off in the wrong direction! But I seem to get my limited Spanish understood and soon we are off that bus and over the road once more to head down the road in a direct line to the awaited destination. We wait on the correct side of the road this time at a place the locals come for breakfast. 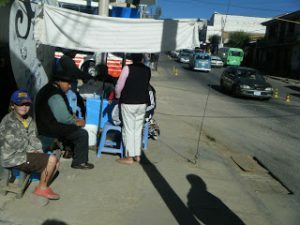 We finally hop on the min-van bus – 2 Bolivianos each (about 30 cents). When we arrive, all we find is a cement works. 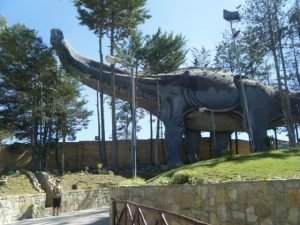 We go up their driveway and this is where we start to see some great life-size models of dinosaurs. Far below you can see the quarry, and the dinosaur model on the road. We are the first to arrive and it is just before 9:00 a.m. and no one else is waiting here, but then it is Monday morning. 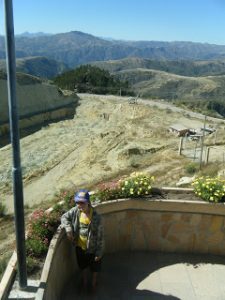 We discover that the guided visit (organize the guide inside) takes about one hour and cost 30 Bolivianos for adults and less for children. Plus 5 Bolivianos extra for permission to take photos – I find this strange – as she pins a paper to my shirt. We head inside and we are met by two English speaking guides. 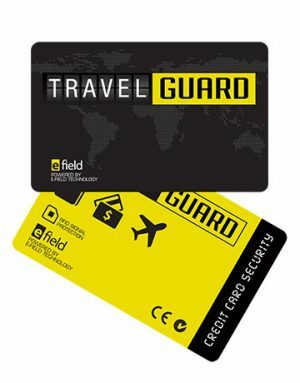 Here, we are offered a guide for FREE if we want – YES, please! 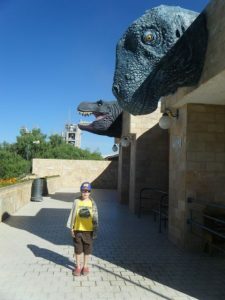 Our guide takes us to the cinema room and lets my son select from a range of films on dinosaurs. This is a great idea as instantly they bond. It is a relaxing area with seating and we are again the only ones here. So our guide retreats outside – I am sure he has seen the film many times over. When it is over, I thought this film was fantastic and learned a lot, and so did Explorason. 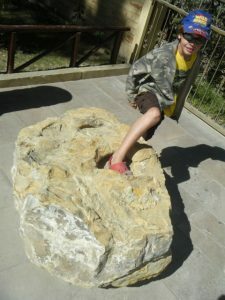 We wander out to the bright and sunny day to find our guide, and he takes us to the fossil area. 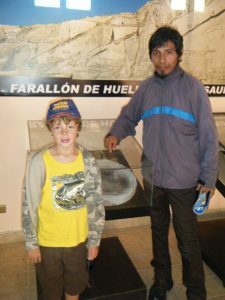 Our guide is great and he is very knowledgeable – and also has a book he can use to refer to any words in English we need to translate. As our guide walks us around the park I notice that he and Explorason are out in front, chatting away and bonding. It is important when traveling to give our kids time away from parents, with one-on-one time with other adults. A good guide is so important as they really are acting as a teacher. 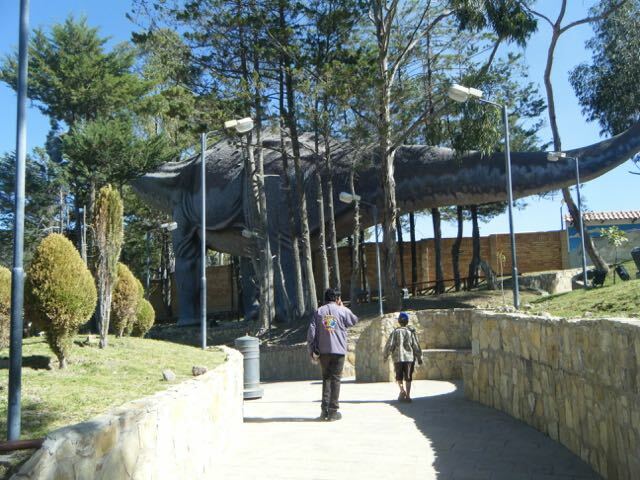 There are life-size models of dinosaurs all over the place here in the park. Our guide tells us details and he is excellent. The actually took measurements from the footprints they found to scale them to size. 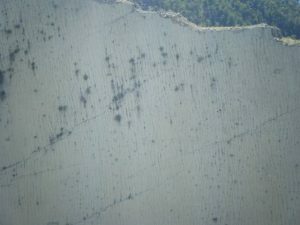 We then go to the viewing area to see the long await dinosaur footprints and this is nothing like we expected. 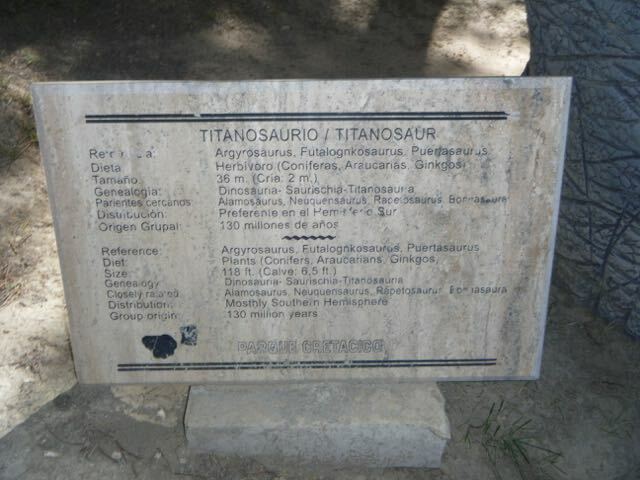 Firstly, we weren’t able to see the dinosaur footprints up close; instead, there’s a viewing platform with binoculars. Secondly, they are not on the ground but up a wall! 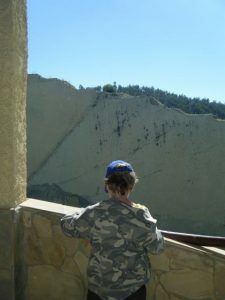 Our guide explains Cal Orkco is a collection of dinosaur footprints deep impressions set into a 70-degree wall of the cement quarry, which used to be a lake floor. 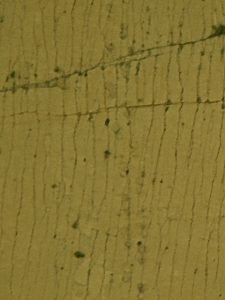 There are distinct sets of tracts and you can see them most clearly in the mustard color photo. Sadly the government is doing nothing to protect this amazing piece of history as far as we can tell. 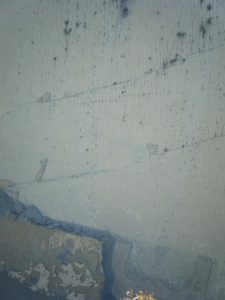 The ‘V’ section fell out of the wall recently due to the movement from the cement quarry machinery. This area had the largest prints in and is clearly seen as a ‘V’ section. I find it a real shame that this area is an archaeological find of great significance yet no one is trying to save it. The quarry has rumbling trucks going along the base area all day long and this is like a constant vibration. This HAS to have a long-term negative impact. 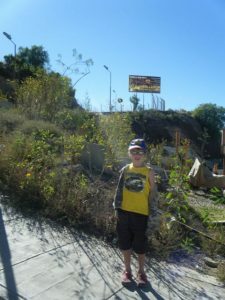 I also wonder why a viewing platform has not been built over the quarry road, but I am guessing the quarry will not allow them. This would then allow a close-up look and really assist in the study. Our guide thankfully has a book where we refer in detail to the footprints and it is a great help. As we head back to the life-size models, we discover it is time to learn about each type of dinosaur that would have roamed these parts. Amazingly, as my son runs past or under the dinosaurs it triggers a sound box that gives us the sound that dinosaur would have made. Needless to say, we have a great time with the model area. 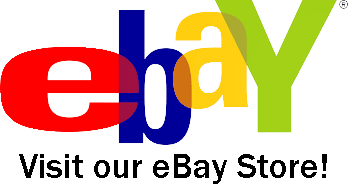 These models are of the highest quality are as professional as you would find in the USA. There is not an ounce of “fakeness” to their looks. 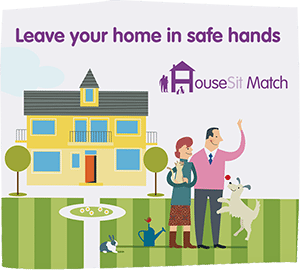 Each model also has a detailed plaque with the relevant information. 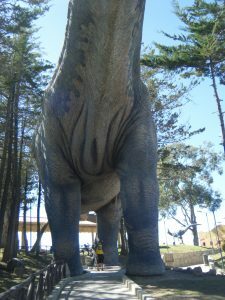 Many, many fiberglass dinosaur and footprint models dot the park area. Some are so large, it is impossible to fit them into the camera screen in one go! 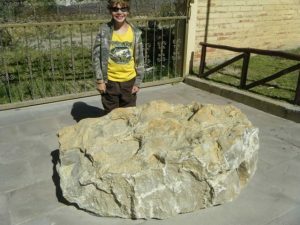 There is one display sandstone with a footprint we can get right to. Wow is my son thrilled at this! Again, I feel this is a treasure that should be kept away from climbing children. But he is too excited to listen and I guess they are recreated so they can make more? 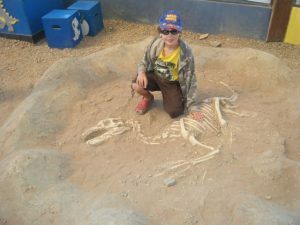 There is a junior area and here you can ‘discover’ a dinosaur skeleton by brushing the sand away. This reminds us of the South Australian Museum back home. 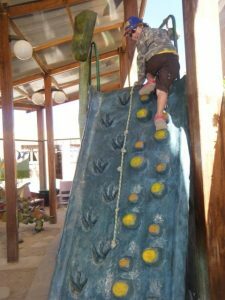 There is also a dinosaur climbing wall and slide, and a few other play items. Explorason has a great time here. It is important with travel he gets a good amount of play time too, so I sit and relax and watch him play. This would be a great place to have a coffee shop I think! I’ve noticed in Bolivia that there are a lot of gender-preferred roles. So men only do some jobs, and ladies only with others. Here, ladies seem to be the gardeners. I love the way the lady gardeners have uniforms adapted to their traditional style of clothes. 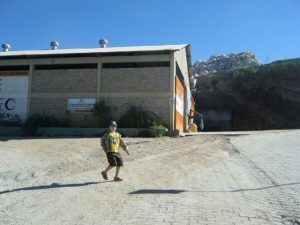 We head back outside and down once more to find the mini-van bus to return to Sucre. We are the first on board. 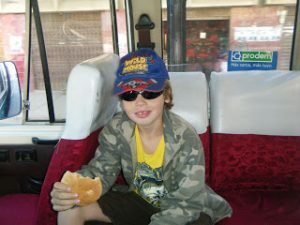 My son gets along well with the driver so the ‘boys’ – that being the driver and my boy, then decide Explorason is to join this driver at the front of the bus and Explorason gets to announce the closing of the door in Spanish. It is amazing to see how wonderful life is when adults take time to interact positively with children. We head back into town but we find the bus doesn’t go back the same way we came and has meandered through roads we have not been on before. We get stuck in a traffic jam in the markets, and finally, we give up and get out and start to walk back to the hostel. Lost we walk the streets for 2 hours to get home, but this is 2 hours by choice! It feels fantastic that we actually get dropped right in the center of the market area. 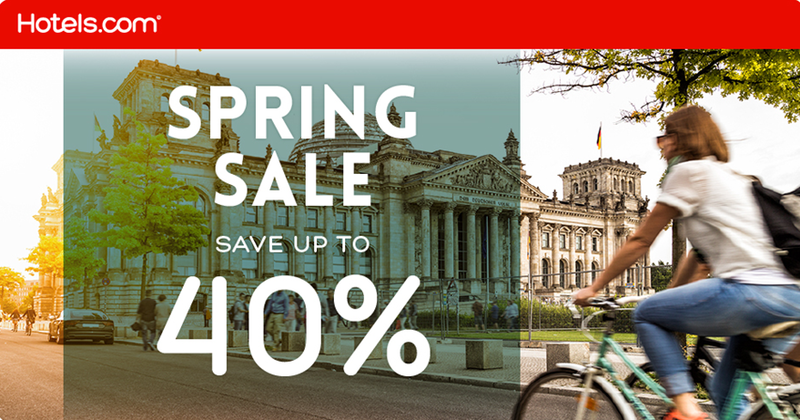 I enjoy the markets and I love to shop and to score a bargain! 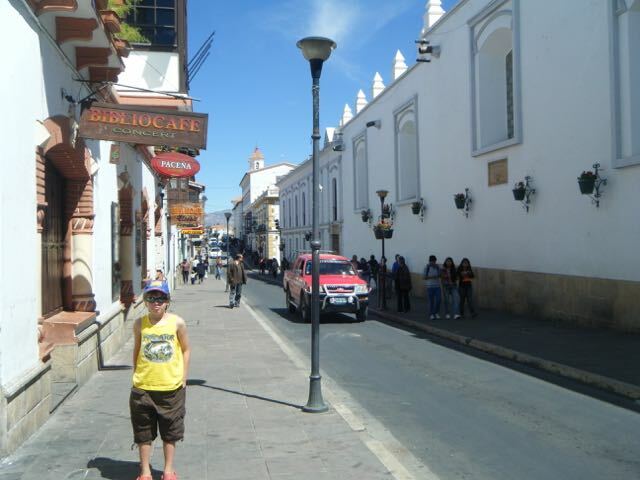 Sucre is a wonderful white-washed colonial town and well worth a visit. 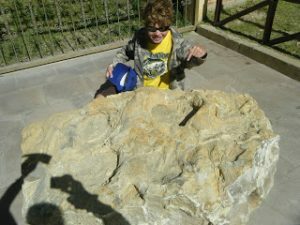 Have you ever seen dinosaur footprints or a dinosaur’s skeleton? 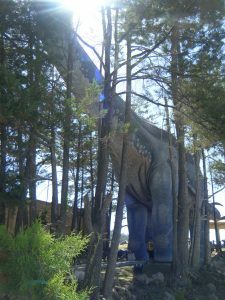 Do you believe in dinosaurs, or do you think they are a myth? 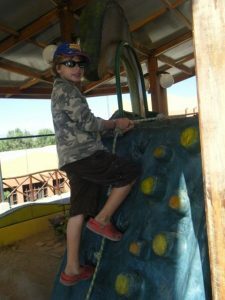 What do you think about travel as a way to educate children? Tell us in the comments below, we would love to know.